After starting second for the GP3 Race 1 in Monza, Jake Dennis had only one mission: to record his maiden victory! And that he did! The Briton passed Series leader Charles Leclerc on lap five for the lead of the race and was quickly followed by his Arden International teammate Jack Aitken. Dennis and Aitken recorded a fantastic one-two for the Arden squad with Jake Hughes from DAMS completing an all British-top three. ART Grand Prix also wrapped up the Teams title – their sixth out of seven attempts. Monegasque Charles Leclerc started from his third pole of the season and retained the lead at the start of the race ahead of Dennis and Aitken. The safety car was deployed briefly after DAMS’ Kevin Jorg stopped on track. Once the race resumed, Aitken was keen to get past his teammate Dennis, whilst further down the pack there was contact between Koiranen GP’s Ralph Boschung and Matevos Isaakyan. The Russian retired in the pitlane while the Swiss was served with a 10s time penalty. On lap five, Dennis got the bit between his teeth and passed Scuderia Ferrari Team Development driver Leclerc for the lead of the race. Aitken was also through on the Monegasque one lap later, as he tried to reel Dennis in. Meanwhile, Hughes began carving his way through the field and picked off title contender Alexander Albon. Dennis held a 0.6s margin over Aitken and 1.4s over Leclerc. Trident’s Antonio Fuoco was keen to please his army of fans at his home race and began to challenge Leclerc for the final rostrum place. The duo made very light contact and both continued, but from that point the Ferrari Driver Academy star lost ground and fell into the clutches of the chasing pack. Hughes was soon up to fifth after overtaking Nirei Fukuzumi and Fuoco with his next target Leclerc. The DAMS’ driver made the move stick into Turn 1 on the ART driver to move into the top three. Dennis had built a small margin at the front over Aitken whilst Hughes was busy posting fastest laps. On the final lap, Aitken had to defend from a charging Hughes whilst Leclerc was busy looking in his mirrors to defend from the attack of his teammate Fukuzumi. It was celebration time for Arden as Dennis clocked his maiden GP3 victory, almost 2s clear of Aitken as they enjoyed a one-two finish. 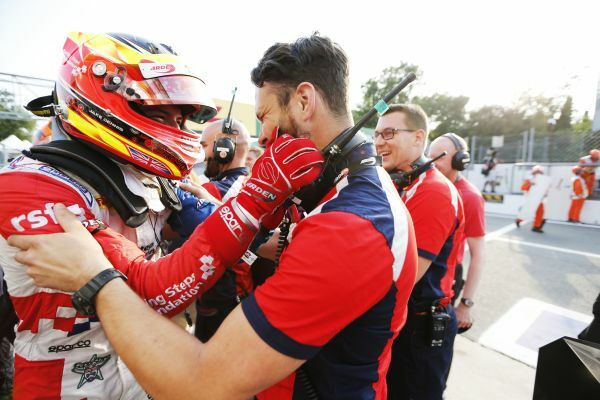 After a difficult round in Spa, Hughes was a happy man to be back on the podium ahead of Leclerc, Fukuzumi, Albon, Nyck De Vries, Fuoco, Matthew Parry and Tatiana Calderon. Leclerc now holds a 34 point advantage over Fuoco with Albon, Dennis and De Vries completing the top five. ART GP enjoyed achieving their sixth teams’ title, with the battle truly on for second and third in the teams’ standings with Arden International moving up to second ahead of Trident and Koiranen GP. Tomorrow’s race starts at 09.15 local time with home hero Fuoco starting from reverse pole. (GMT+2).